The Fast Tracks website and ordering system is owned & operated by Fast Tracks Hobbyworks Inc. 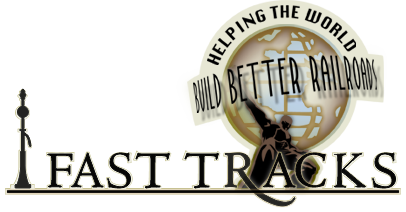 When you visit the Fast Tracks website at www.handlaidtrack.com or www.fast-tracks.net some information, such as the site that referred you to us, your IP address and navigational information, may be collected automatically as part of our website's operation. This information is used to generate user profiles and to personalize our website to your particular interests. On some occasions we may ask you to provide information using online forms. For example, we may ask for your name, postal address, email address, telephone number, credit card number or other personally identifying information to fulfill your purchase requests. We may also ask you about your age, hobbies, income, gender or other information to participate in surveys or other online activities. Providing information on online forms is always voluntary, and you are free not to complete any online forms. If you choose not to, however, some products and services may not be available to you. Our websites are hosted on servers located in the United States. We do not share or sell any of the information that you provide with anyone outside of Fast Tracks Hobbyworks Inc. without your prior knowledge and permission. We reserve the right to disclose your personal information if required to do so by law, or in the good faith belief that such action is reasonably necessary to comply with legal process, respond to claims, or protect the rights, property or safety of our company, employees, customers, or the public. How Do We Protect The Information We Collect? We implement a variety of security measures to maintain the safety of your personal information. Your personal information is maintained behind secured networks and is only accessible by a limited number of people who have special access rights to such systems, and are required to keep the information confidential. When you place orders or access your personal information, we offer the use of a secure server. Credit information you supply is transmitted via Secure Socket Layer (SSL) technology to a PCI compliant credit card processing service. Other personal information is also transmitted via SSL, and maintained in an encrypted state in our hosting service's databases and is only accessed as stated above. Like most Web sites, our servers maintain log files. This includes Internet Protocol (IP) addresses, browser type, Internet service provider (ISP), referring/exit pages, platform type, date/time stamp, and number of clicks to analyze trends, administer the site, track movement in the aggregate, and gather broad demographic information for aggregate use. IP addresses, etc. are not linked to personally identifiable information. WE DO NOT SPAM. Unless you have specifically subscribed to receive the Fast Tracks Newsletter or our Product Updates service, we will not send you any promotional information whatsoever. When you visit the Fast Tracks website, we place small text files called "cookies" in the browser directory of your computer's hard drive. A cookie is a small piece of information that a website can store on your computer and later retrieve. The information that cookies collect includes things such as the date and time of your visit, your registration information, your navigational and purchase activity, etc. Cookies offer you many conveniences. They allow our website to recall previous registration information, previous purchase information and so on. This makes the use of our websites more convenient for you. Most browsers allow you to decline cookies, but if you elect to do so, our purchase pages will not work correctly. You are free to delete cookies after your session. Your browser should contain instructions on how to do this. We use both session ID cookies and persistent cookies. Session ID cookies are automatically deleted when you close your browser. A persistent cookie is tored on your hard drive for an extended period of time. Persistent cookies can be removed by following your Internet browser's help file directions. Monitoring software that we use, such as Google Analytics will place third party cookies on your computer. These cookies are used to record information about your visit to our website. The information recorded by these cookies is only used by us to produce compiled and anonymous reports of visitor traffic to our website. To modify your e-mail subscriptions, please let us know by modifying your preferences in the My Account section of our website. Please note that due to email production schedules you may receive any emails already in production. To delete all of your online account information from our database, sign into the My Account section of our website and remove your shipping addresses, billing addresses & payment information. Please note that we may maintain information about an individual sales transaction in order to service that transaction and for record keeping. We do not sell, trade, or otherwise transfer to outside parties your personally identifiable information unless we provide you with advance notice, except as described below. The term outside parties does not include Fast Tracks Hobbyworks Inc. It also does not include website hosting partners and other parties who assist us in operating our website, conducting our business, or servicing you, so long as those parties agree to keep this information confidential. We may also release your information when we believe release is appropriate to comply with the law, enforce our site policies, or protect ours or others' rights, property, or safety. In the event Fast Tracks Hobbyworks Inc. goes through a business transition, such as a merger, being acquired by another company, or selling a portion of its assets, your personal information will, in most instances, be part of the assets transferred. This policy was last modified on January 1, 2016. We welcome your questions, comments, and concerns about privacy. Please email us with any and all feedback pertaining to privacy, or any other issue. Please visit our Terms and Conditions webpage to learn more about the using our website and purchasing our products. This policy was last updated on January 1, 2016.